After just a few episodes of E!’s The Royals, we’re already enthralled. It’s half Gossip Girl and half every Anglophile’s dream. The future king sure looks a lot like a young Prince William, but what other similarities are there between real life and fiction? As if the names weren’t similar enough, Liam looks an awful lot like our fair prince. And, sure, in this instance, he’s the younger of two brothers. But he’s very much like England’s young heir, too. He mostly believes in good and does well, but he occasionally makes poor choices and ends up getting caught. Just like William, Liam isn’t in the press nearly as much as his other sibling (Eleanor, his twin sister). However, in his younger years, William wasn’t always perfect. We can see where this is going. In the case of Charles, Diana and Camilla, various biographers have told different stories, but the one that seems most accurate is that Charles and Camilla dated first, however, Queen Elizabeth II didn’t approve so he married Diana… only to have that marriage crumble. On The Royals, Liam met and dated Gemma first. Then, brokenhearted over Gemma’s departure, hooked up with Ophelia. Phe’s pretty, sweet and a regular person so, of course, Liam’s mom doesn’t approve. Her way of dealing with Ophelia? Luring back Gemma and placing her in Liam’s path over and over again. Who’s Diana and who’s the Camilla? It’s hard to pinpoint. We hate Gemma! Just as we’ve always vilified Camilla. 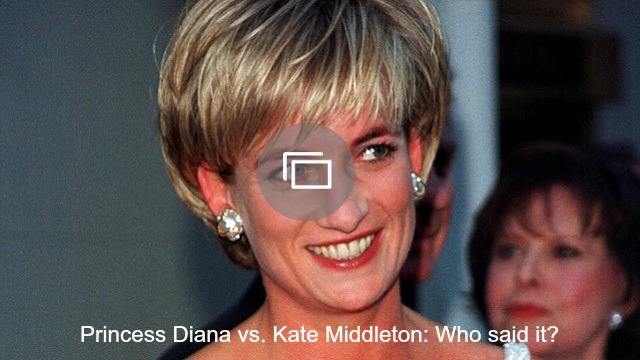 In terms of socioeconomic hierarchy, though, Gemma is also the Diana of the two. However, we can already tell that Ophelia is destined to be the fictional people’s princess. All right. We sincerely hope that Eugenie and Beatrice aren’t nearly as idiotic as The Royals‘ spare twin cousins. However, upon first meeting them, their goofy style immediately reminded us of the real royal girls and their crazy fascinators. We don’t know much about Eugenie and Beatrice’s private lives, but they’re definitely more fashion forward and more capable of going out into the real world and not being so uptight. Seems like an accurate comparison to us. … and a bad attitude. On The Royals, Eleanor is Liam’s twin sister, the baby and the only girl. She’s also a bit of a rebel and regularly butts heads with her mom. She loves her twin brother, though, and the brother that died in the premiere. His death has an impact on everyone in the show, much like Princess Diana’s did. And, just like we sometimes saw with Harry, Eleanor seems to be taking it the hardest and acting out in some truly un-royal ways. We still adore her, though! There are many people who believe the reason Queen Elizabeth II has yet to go ahead and turn over power to Prince Charles is because she knows he’d rather not just be a figurehead. Chuck likes to get his hands dirty (literally — he runs a farm) and take part. Many people see him as the least royal of all the royals and expect that when his time does come, he’ll soon go right ahead and pass it to William. On The Royals, the moment the king’s oldest son is killed, he begins considering abolishing the monarchy. It’s clear he’s miserable and has been for a while. Intrigued by this new brand of royalty? The Royals is a wild roller coaster of very public family drama. It’s lush and decadent and yet supremely funny and cynical all at once. It airs every Sunday on E!